As some of you may remember, a few months ago we posted info about an upcoming sequel to Sydney Saves A Species: Message from the Manatee. Don't worry, this is still in the early works! The idea is there, but publishing a book takes a lot of time and money. Once a draft is written and we have found an illustrator, our fundraising goal will be set! We want to keep with the themes from the first book and have children illustrate the book. It may take some time, so fans of Message from the Manatee, please be patient! Aside from this, I, the President and author, am currently interning at Clearwater Marine Aquarium which keeps me busy! Look for a spotlight on the most famous resident of the aquarium, Winter, in our next newsletter! If you would like to help with sequel, please contact us, and remember to keep submitting articles, pictures, and other stuff for our newsletter! All of us here at Kids Making A Difference would like to wish a very happy 50th birthday to Hubbs-Sea World Research Institute! Throughout the years, we have worked very closely with their stranding team in Florida. Here's to another 50 years protecting our oceans! Check out our photos with Hubbs Sea World Stranding team under our photos page. We have donated many needed items to them including a field laptop and GPS walkie talkies with hopefully more to come. Our President, Stephanie's, dream is to raise enough money to buy them a truck for dolphin and whale stranding response. If you would like to help us reach our goal, be sure to donate today. Together we can make a difference. For more information about HSWRI, visit their website. 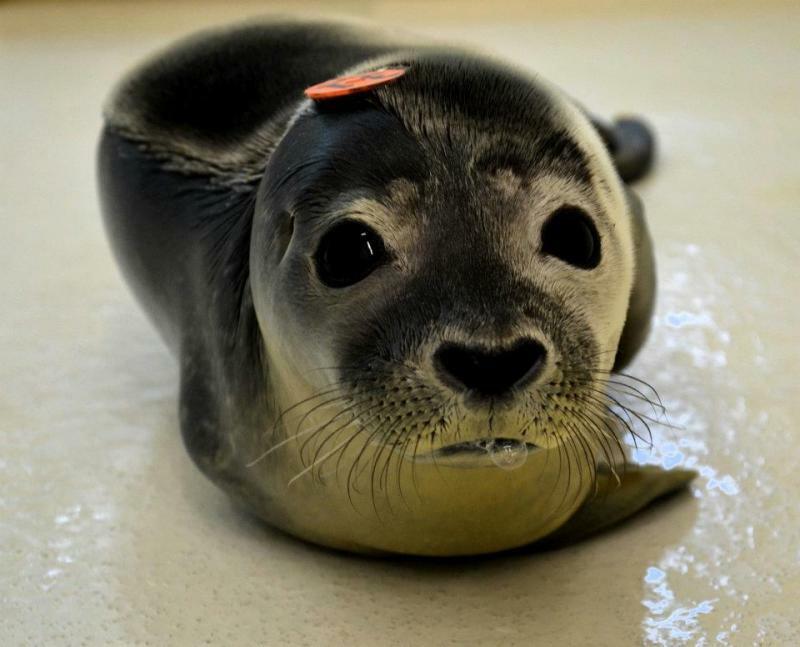 Thought I would share this great opportunity to help seals. 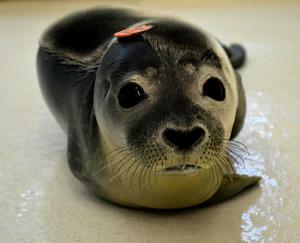 The Marine Animal Rehabilition Center in Biddeford, ME is hosting a Frolic for Flippers 5K on September 22, 2012. You don't have to live in the New England area to attend, you can register to frolic from afar like I did. The Marine Animal Rehabilition Center is a wonderful facility that rehabilitates seals, sea turtles, and the occasion porpoise. Currently, it is harbor seal pup season, so they are very busy with lots of pup. For more information you can visit the MARC website. Less than 2 months until November which is Manatee Awareness Month! Kids Making A Difference has made a facebook event for this special occasion. Be sure to invite your friends. The simplist way to make a difference is to spread the word. 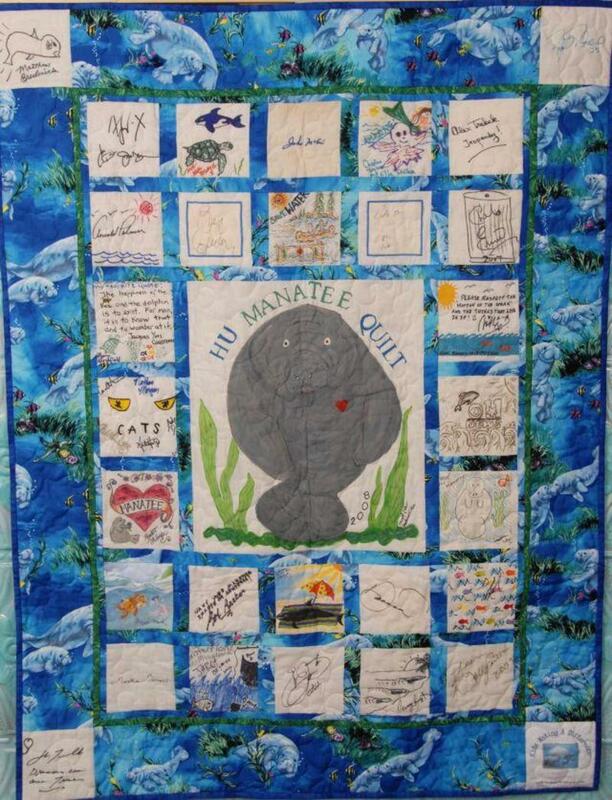 Do you have any suggestions on how to help manatees this upcoming Manatee Awareness Month? Email us at president_kmad@verizon.net. We would love to hear from you! One of our newest members, Katie, wrote a blog about Kids Making A Difference on her Xanga. Here is what she wrote. Kids Making A Difference is a non-profit organization focused on protecting Gulf Coast Animals like manatees. The program is based in Grapevine, Texas and was founded by Stephanie. Joining Kids Making A Difference is 100% FREE, so it is avalible to anyone. Members can recieve the KMAD e-newsletter SEA COW, and/or write or draw for the newsletter. They can also participate in clean-ups, educational programs and other activities. You can visit the KMAD website at kmad.org or contact Stephanie at president_kmad@verizon.net. It has now been a year since the infamous Gulf Oil Spill. Check out this link which has some iconic images. Don't forget-- Earth day is this Friday, April 22nd!!! Check out these pictures of a rescued baby dolphin in Uruguay. Walkers on the beach found the dolphin, which is now being nursed back to health by the NGO Rescate Fauna Marina. The injuries were mostly likely caused by a fishing net. Do you know about the Amur leopard? That's the question member Elsie of Massachusetts asks. Elsie tells us there are many reasons why we should spread the word about the Amur leopard. "Most people don’t even know about them! They are really endangered and there are about 30 through 35 in the wild. They eat roe deer, red deer, sika deer, musk deer, wild boar, and more! they are rare big cats, they are night hunters, and their ambush technique is used also by tigers. Thats why you should spread the word about the Amur leopard." We couldn't agree more. To learn more about these magnificant creatures and what you can do to help check out The Tigris Foundation. Congratulations of Kathy from Texas! She has won the latest contest. Thank you to everyone who entered, we had a record number of entries! Look for the next contest in the next issue of The Sea Cow which will be in the mail soon. Remember, if you have anything you would like to submit for The Sea Cow, be sure to send or email it to Kids Making A Difference! One thing kids can do to show support for our oceans is go see the Disney Nature's movie "Oceans". Lets send a message that we care about our oceans with record number people people viewing the movie. Also, kids can buy the song "Make A Wave" which will show support. Kids get out there and write a letter to your local Senators and Representatives. Let them know we care about the future of our oceans and don't want offshore drilling. We can also help everyday by conserving and using less energy. So turn off lights those lights when you leave the room and walk when possible. Less energy used, less oil needed. What about the Manatees in all this? It is probably just a matter of time before the manatee is effected. The oil is expected to damage seagrass beds at the tip of Florida. 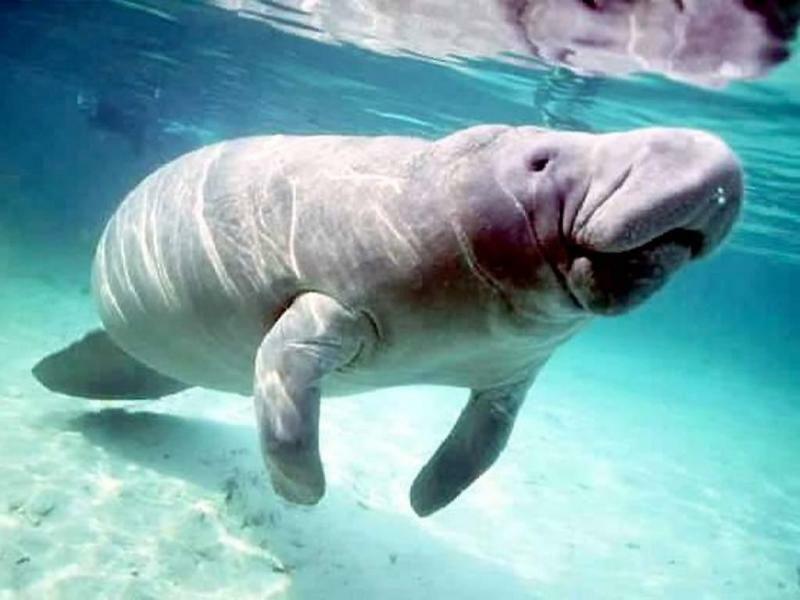 What does that have to do with manatees- Seagrass is the main diet of manatees. 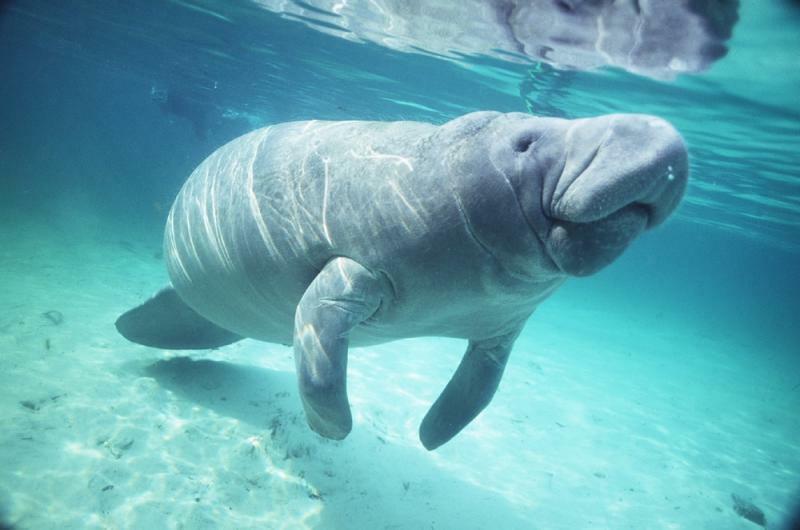 The oil can also cause injury to the manatee as many animals won't be able to avoid the oil. As I’m sure you all know, Earth Day is April 22, and it’s fast approaching. While many know about this special day now, in the past that wasn’t case. In 1962, Senator Gaylord Nelson decided something needed to be done about the deteriorating state of the environment. However, this wasn’t seen as a problem in the political world therefore making it basically non-existent to the people in power. The citizens of every state saw the effects of their actions on the environment and wanted to do something about it but the opportunity never presented itself. Senator Nelson came up with an idea to propel environmental issues into the political “limelight.” He decided to discuss the issue with President Kennedy and soon was on a plane to Washington D.C. to meet with Attorney General Robert Kennedy. After coming up with a plan they proposed it to the President who liked the idea. The plan was for President Kennedy to go on a conservation tour to help inform those of the public who were not aware or choose to ignore the obvious sign of environmental degradation, that all of that was about to change. In September of 1963, President Kennedy started his five-day, eleven-state conservation tour. Unfortunately however, the tour did little to further environmental conservation among the politicians. Six years passed until Senator Nelson came up with the idea of Earth Day while on a conservation tour in 1969 out West. Around this time Anti-Vietnam War demonstrations called “teach-ins” were being held all around college campuses. Nelson thought, why not have a teach-in on environmental conservation. The senator decided to hold a grassroots protest over what was happening to the environment and announced the plan at a conference in Seattle that in the spring of 1970 there would be a nationwide grassroots demonstration on behalf of the environment. Nelson was sure that they energy over the anti-war groups would easily filter into helping the environment and he was right. The story over his organization spread like wildfire and finally the American people had a forum to tell the politicians exactly what they needed to hear. Earth Day worked so well due to the grassroots response. They didn’t have the time or the money to spend years getting thousands of demonstrations worked out; the American people didn’t need them. That was the remarkable thing about Earth Day, it organized itself. 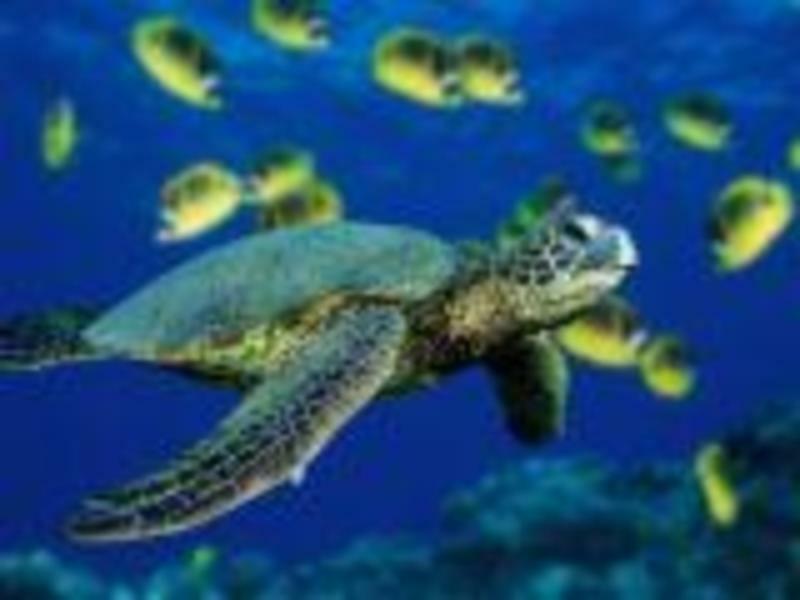 Disneynature decided to show its appreciation for our planet with their film Earth and their new upcoming film Oceans. These amazing documentaries show us the true beauty and rarity of our planet and why we should appreciate what we have more. On Earth’s opening week Disneynature donated $1 for every ticket sold towards environmental conservation programs. While $1 may not seem like much, it adds up to quite a profit. Disneynature is doing the same for Ocean’s opening week so go out and see all the wonder and amazement that lives in the sea. You just might learn something you didn’t know before. What you can do for Earth Day is from 7-8pm turn off all the electronics in your house, work place, or wherever you might be. This helps conserve energy and gives you the needed break from our electronic world. And remember, just because Earth Day only happens once a year doesn’t mean you have to stop helping the Earth. Always recycle, don’t waste our world’s natural resources cause we only have what’s available now, don’t litter, and generally make better decisions regarding the Earth. Thank you to KMAD member Jillian C. for writing this blog about Earth Day. "Spay or Neuter Your Best Friend"
As a fundriaser for homeless pets, we are selling t-shirts that say "Spay or Neuter Your Best Friend" and have a cute dog on them. All proceeds will benefit homeless pets. To order yours today, look for the order form under the Newsletters tab. You can also order Kids Making A Difference shirts, too. Congratulations to Molly of CA for her winning entry. Molly knew that Kids Making A Difference was featured as Charity of the Day on GoodSearch. Did you know GoodSearch is a great easy way to contribute to Kids Making A Difference with little to no effort? Just search or shop. Why not download the Kids Making A Difference toolbar? once added to IE or Firefox, each time you shop at more than 1,300 stores (from Amazon to Zazzle!) a percentage of your purchase will automatically be donated to Kids Making A Difference - at no cost to you (and you may even save money as the toolbar provides coupons and deals as well! ). The toolbar also has a search box and each time you search the Internet, about a penny is donated to Kids Making A Difference. http://www.goodsearch.com/toolbar/kids-making-a-difference-kmad Its that easy! Don't forget to enter our contest, winning is easy and fun- Our next winner could be you. Thank you to all KMAD supporters, on January 12th over 250 people looked at the site! Help us spread the word, tell your friends about KMAD. Let's see if we can beat this record. Also, thank you to GoodSearch for making us Charity of the Day on January 12th. Kids Making A Difference is going to be Charity of the Day on Goodsearch.com and Goodshop.com on Janurary 12th. You can use GoodSearch and GoodShop everyday and each time you do we get a donation. Just be sure to type "Kids Making A Difference" in the "Who Do You Goodsearch For?" box. Be sure to check us out the their homepage on January 12th! There is offically less than 2 days left on the HuManatee Quilt auction! Let's see if we can beat our goal of raising $5,000 for Hubbs-Sea World Research Institute. Click here to go to the eBay auction page to bid. 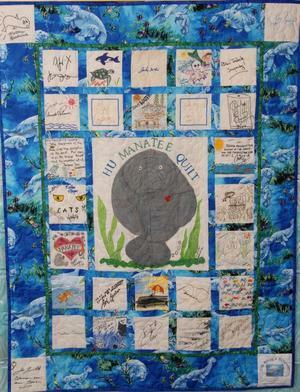 Become a fan of our Facebook page and let us know you are attending the HuManatee Quilt auction Facebook event. To get the latest KMAD news, you can now follow us on Twitter and become a fan of our Facebook page. Olivia's sent in her entry with the correct answer to our newsletter contest. Foster Kitten Harper was named in honor of the Harp Seal. This kitty's seal point coloring was a big clue and many sent in the correct answer. Congratulations Olivia, your lucky entry was drawn and portable cd player is on its way! I am happy to report that Mom Kitty and babies are all progressing well and with new names, mom is Roxy and babies Harper and Jasper. Upon their first veterinarian examination, Roxy was found to have a very bad upper respiratory infection and be severely underweight. It was also discovered that she has a misaligned jaw from a previous injury which it was fractured and since healed. Her babies were also found to be underweight and in poor condition. Thanks to the wonderful care of Dr. Williamson at Boulevard Animal Hospital and our eBay fundraising sales (allowing us to buy the necessary medication and proper nutrition) all are on the mend. Roxie has gained a half a pound in just three days of proper nutrition and TLC. She continues to gain and is no longer just skin and bone. Little tikes Jasper and Harper are doing well too. Due to Roxy’s poor condition babies had to be bottle fed. They are growing so fast. 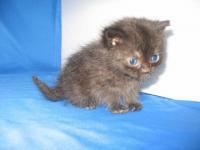 Eyes are now completely open, no more eye infections or fleas; they are beginning to eat solid foods. You can tell they are on the road to recovery as Jasper and Harper are becoming quite rambunctious little ones. Mom, Roxy, is really beginning to enjoy her daily “spa” treatments and pampering, where it is all about her. Fostering animals for a local animal rescue is a great and fun way to volunteer. 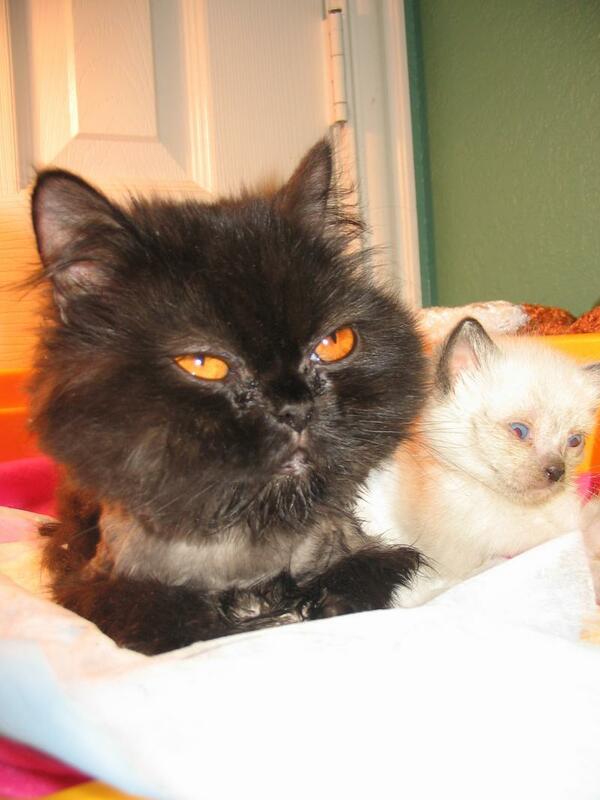 Stephanie, the KMAD President, is currently fostering a cat and her two kittens. The cat came into the shelter because a family lost their home abandoning their pets. Once in the shelter the cat gave birth to the kittens. To get them out the the stressful shelter environment, Stephanie is fostering them until they are old enough to be adopted. Here are some pictures of the kittens at almost 3 weeks old. If you would like to help make a difference in this kittens' lives and the lives of other cats, please donate to Kids Making A Difference. Thanks! Kudos to all those who submitted the correct answer for our May Contest. With it's fluked dolphin like tail, smooth skin and weighing on average 600 pounds, the picture was that of a dugong. Congratulations to our lucky winner Brodie of Massachusetts. Brodie's entry was chosen to win the mini camcorder. With a record number of entries and in honor of World Turtle Day, we decided to give all those entries a second chance at being a winner. Congratulations to Carly of Illinois. Her entry was drawn for our bonus prize and is now the proud owner of a Turtle Petquarium. Congratulations to our winners. Be sure to watch in our newsletter for the next contest. The next winner could be you! Congratulations to Patrick of Bedford Texas. Patrick's entry was drawn Feb 15th and is our winner of the 1GB MP3 player. Be sure to look for our next contest details in the upcoming edition of the SEA COW newsletter. Winning is easy and fun. Kenzie is all smiles (if you look closely you can see th manatee is smiling too) for she is our November contest winner. Kenzie has won our Manatee WebKinz and we hear they have become fast friends. From the smiles on their faces, we can see they are both happy to have found each other. Congratulations Kenzie and thanks for giving our manatee friend such a great home! Be sure to check back regularly for our next contest and your chance to win. Our next winner could be you. YAY! We did it, thanks to your help we reached our goal of 1000 "GoodSearches" for the month of October. Remember to continue to GoodSearch. November 15th is Steve Irwin Day. Show your support by wearing khaki or visiting the Australia Zoo. To show your support, you can purchase a Wildlife Warrior Wristband from the KMAD store and 100% of the proceed will benefit the Australia Zoo in Steve's memory. For more information on Steve Irwin Day please visit www.australiazoo.com.au. Watch for your the special edition Manatee Awareness newsletter due out soon! Be sure to enter the contest. In celebration of the manatee, check out our newest item in the store, the pasta manatee. A must have for manatee awareness month. Also, free shipping for the month of November. Don't delay, order today! October's contest winner is....Adelaide. Congratulations, for her submission, Adelaide wins The Little Mermaid Ariel's Beginning DVD. We know she'll enjoy the movie and keep a watch out for our favorite marine mammal in the movie..the Manatee! Check back often to our site. November is manatee awareness month and we have lots of exciting things coming in celebration of the Manatee. Don't delay enter today! The contest ends October 15th. We are very excited about this new item to our store , the fabulously fun book Sassafras Goes to Hollywood by Lynn Hirshfield and Dena Fishbein. Proceeds from this book go to helping homeless pets. Don't delay order today as supplies are limited. Congratulations to our contest winner. Congratulations to our Turtle Contest Winner. 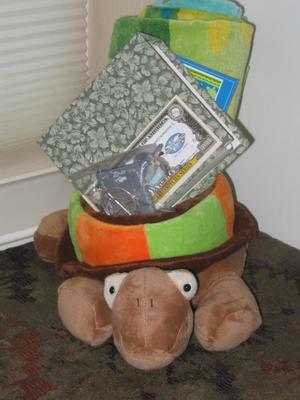 Jillian sent in the winning entry and has won this wonderful Turtle basket complete with Turtle beach towel and photo book. Be sure to watch for our next contest for your chance to win great prizes. May 23, 2008 is recognized as World Turtle Day. In celebration of these glorious creatures, submit your turtle crossword puzzle from our newsletter to win a prize. Didn't get our newsletter, sign up today. "My favorite animal is the turtle...For the turtle to move, it has to stick its neck out." What if Kids Making A Difference earned a penny every time you searched the Internet? Or how about if a percentage of every purchase you made online went to support our cause? Well, now it can! Just go to www.goodsearch.com and be sure to enter Kids Making A Difference as the charity you want to support. And, be sure to spread the word! Earth Day is fast approaching and to celebrate I challenge you to participate in a black out on April 22nd. For one hour, 7pm-8pm, shut off all the lights and turn everything off in honor of Earth Day.